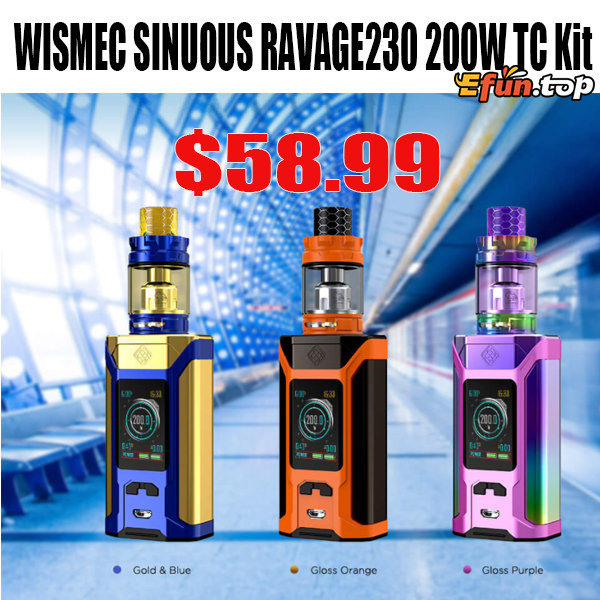 The WISMEC SINUOUS RAVAGE230 Kit consists of SINUOUS RAVAGE230 Box Mod and GNOME King Sub Ohm Tank. Powered by dual 18650 batteries, RAVAGE230 is able to fire up to 230W. Moreover, featuring the unique crown molding shape and perfect color scheme, the gorgeous GNOME King atomizer that utilizes the brand-new WM-M coil and updated WM01 coil for intense flavor can perfectly combine with SINUOUS RAVAGE230 in terms of appearance and performance. This time RAVAGE230 will change your vaping again.